Get ready for the biggest, the loudest, the craziest party ever! 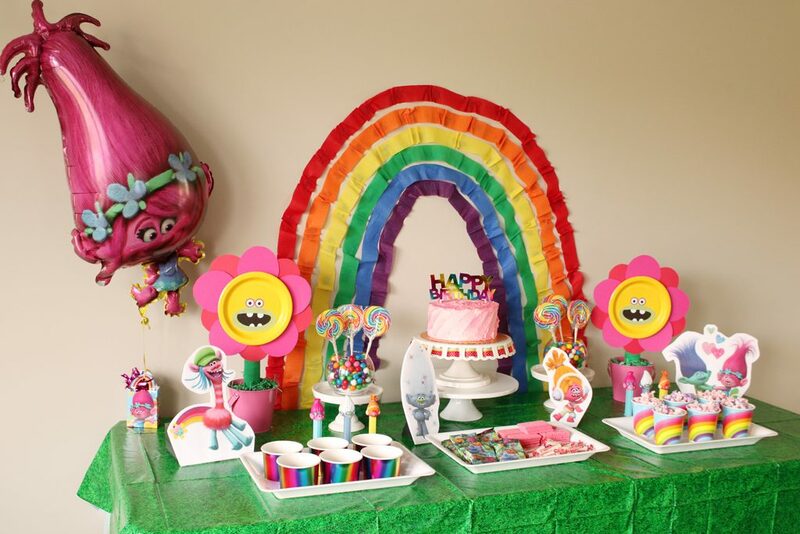 It’s Trolls party time! The positive spirit of these high haired creatures is addicting and their sweet tunes aren’t too bad either. 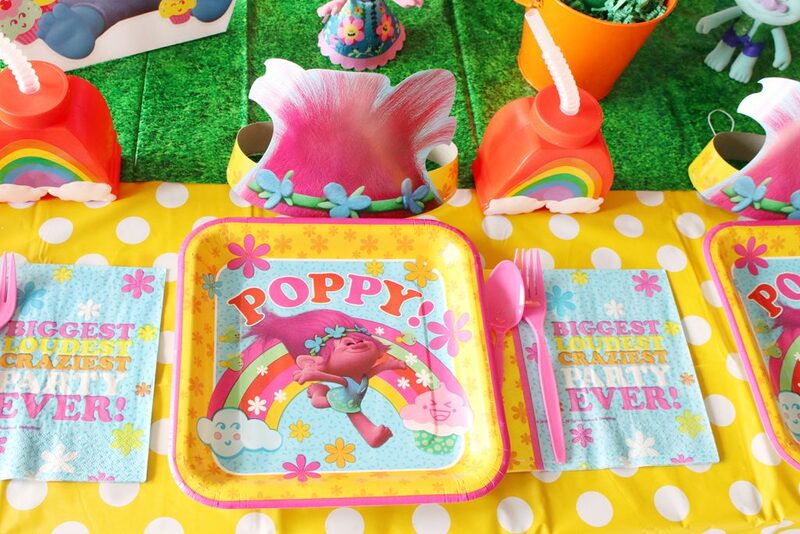 Be prepared to spew rainbows and fart glitter with Poppy, Branch and the whole Trolls gang when throwing a rainbow filled celebration for your little princess! No troll left behind! 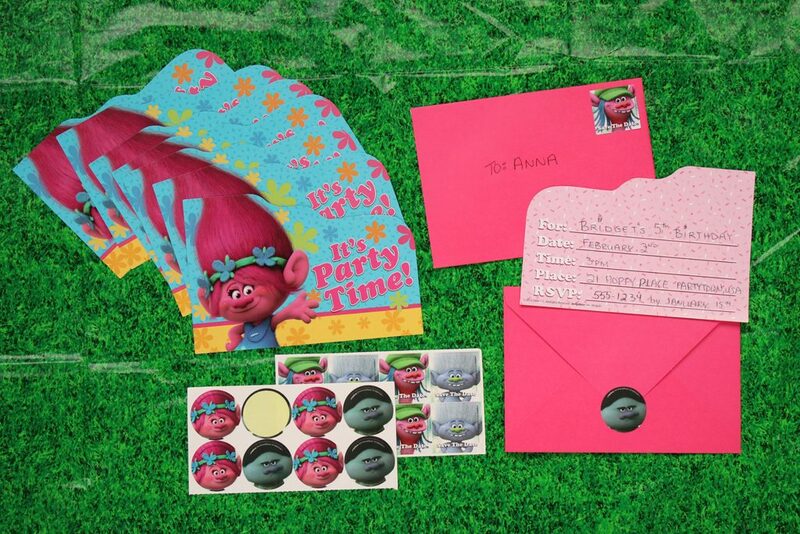 If you don’t have time to create handmade invitations like Poppy does for Branch, you can send out cute postcard style Trolls party invites featuring your favorite pink haired princess. Just know that everybody’s gonna be there – EVERYBODY! Turn your party space into floral filled space under the Troll’s tree and welcome the wilderness inside. 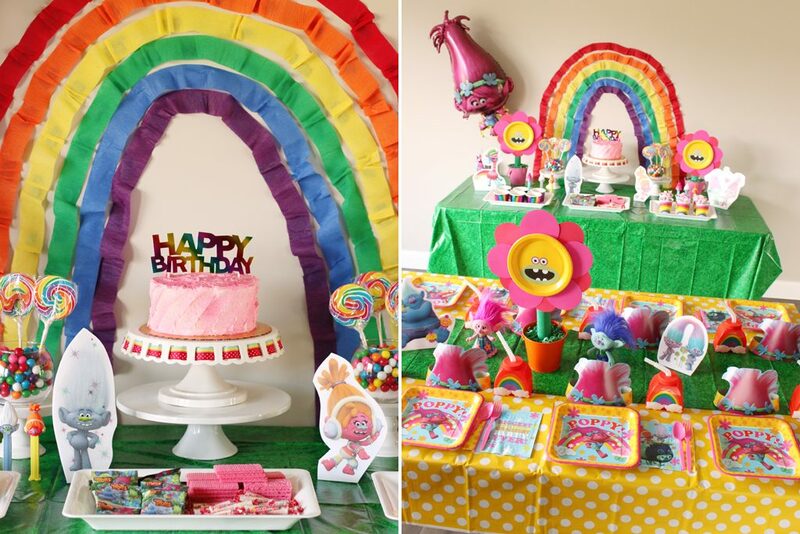 Use crepe streamers and painter’s tape to build a beautiful rainbow behind your dessert table and lay a grassy green tablecloth down on your surface. Float a Poppy balloon nearby and make sure to use a Trolls themed balloon weight to keep her from leaving the party early! 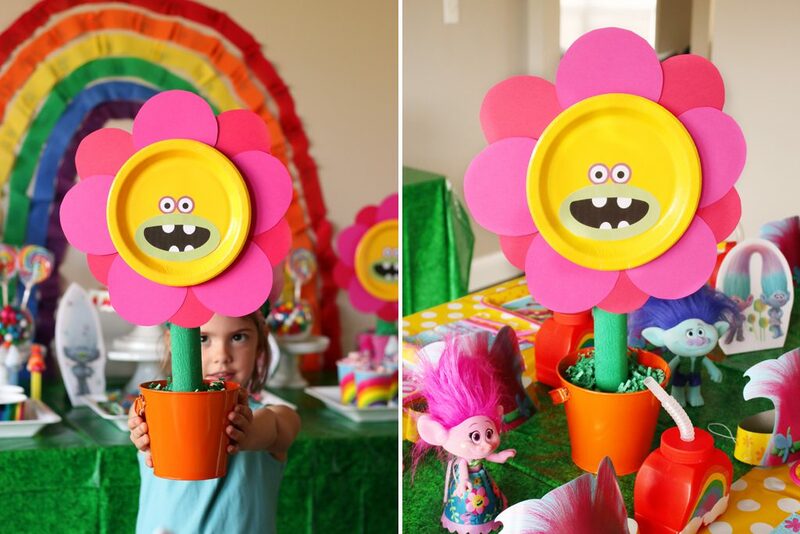 Dress your dining table with bright colored tablecloths and another strip of a grassy print to allow for your faux Trolls flowerpot to bloom down the center. 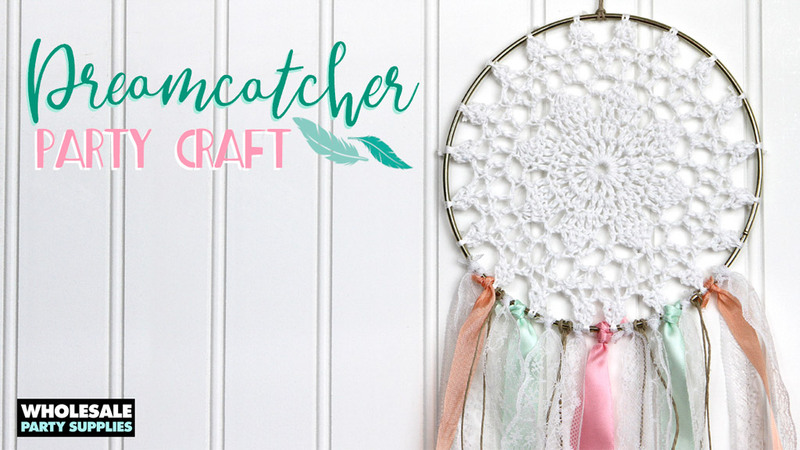 Learn how to create this fun party DIY that includes free printable templates for the faces! 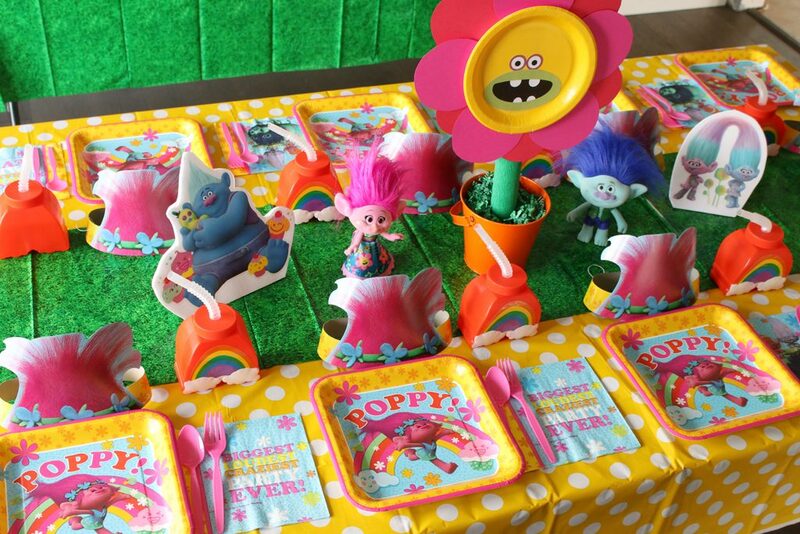 Use Trolls tableware, rainbow drink cups, and Poppy party hats for more hair raising fun! 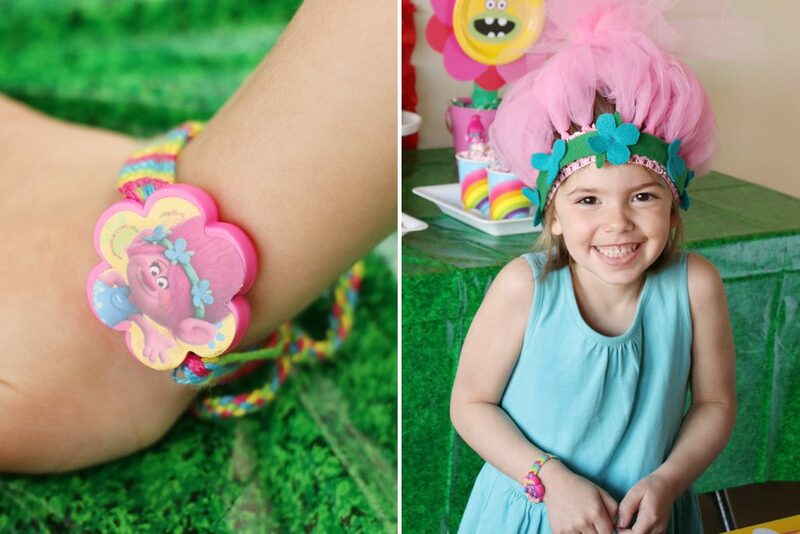 (If the birthday girl wants an extra special costume for her Trolls party, DIY her one! Raid your daughter’s toy collection to pull out any Trolls dolls that will stand on their own to add to your centerpiece display. Tip: fill in the gaps with wall clings applied to foam core. 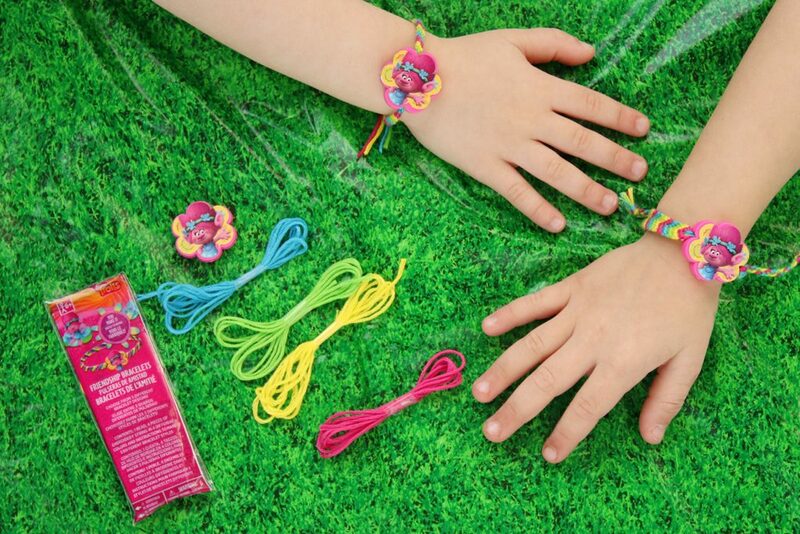 Bonus: when the party is over they peel off and can be used to dress her bedroom walls! One thing you should not be serving to eat at this party is a Troll! 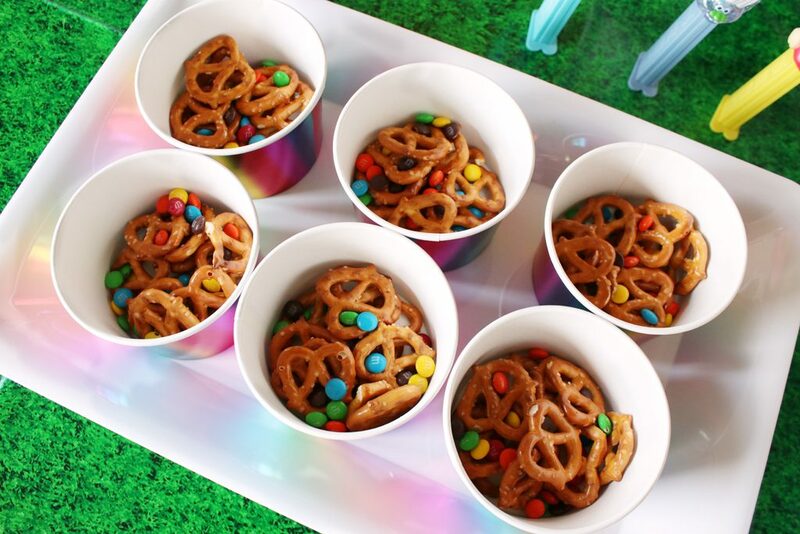 Instead, let friends think they’re riding on a rainbow when filling their plates with colorful treats. 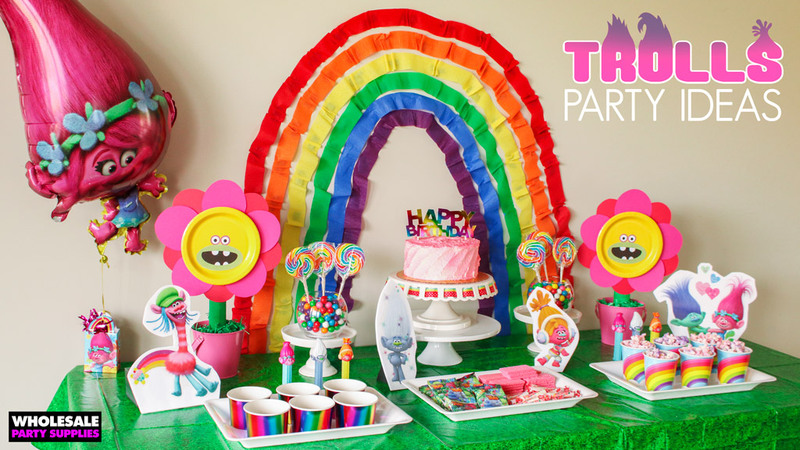 Let the main cake speak for itself at this Trolls Party with a rainbow metallic topper. 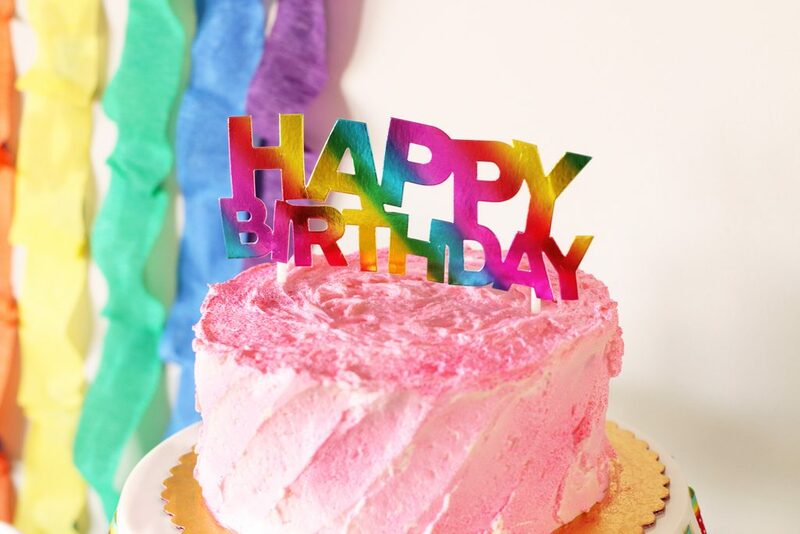 Tip: you don’t need to pay extra for a fancy bakery store cake thanks to this quick party hack! Tip: Consider edible options for your glass vase fillers. 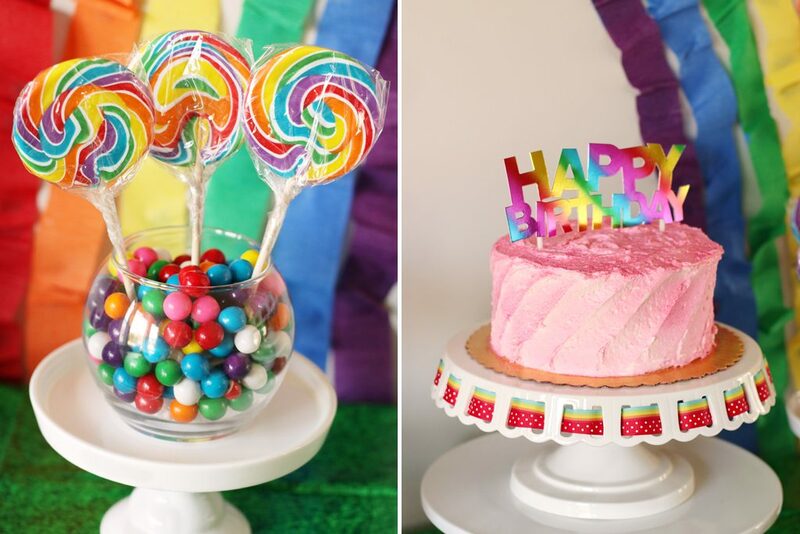 These rainbow gumballs helped feature some very lickable lollipops! 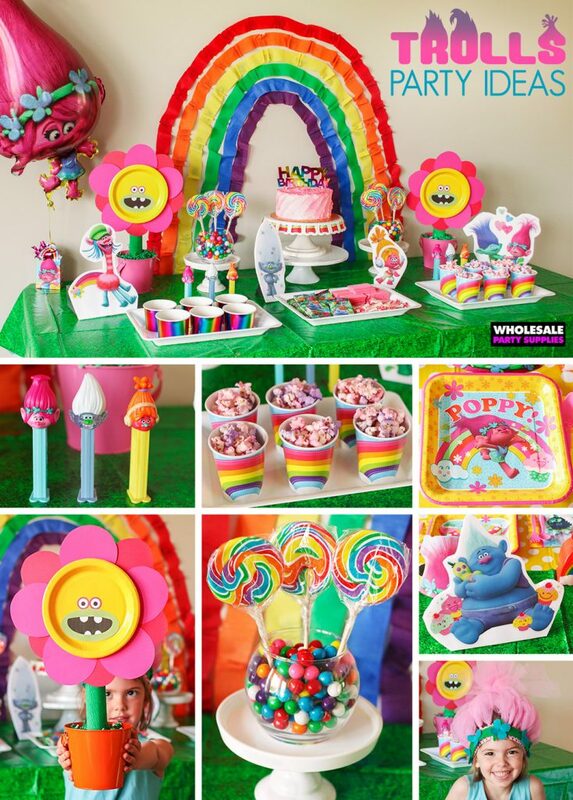 Feature rainbow colored food, sweet treats and drinks on this dessert table! 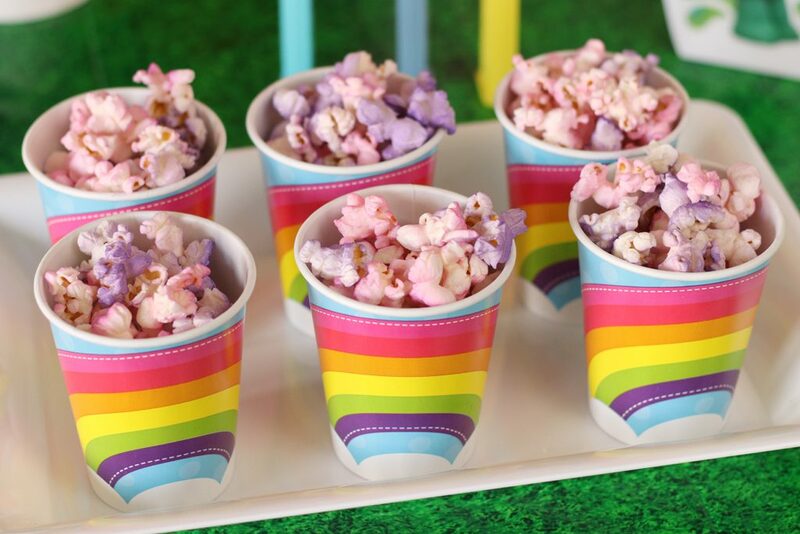 If your treat doesn’t match your color scheme, offer it in rainbow themed treat cups or tall drink cups to have it BLEND IN like Poppy and King Peppy hiding from the Bergen Chef. 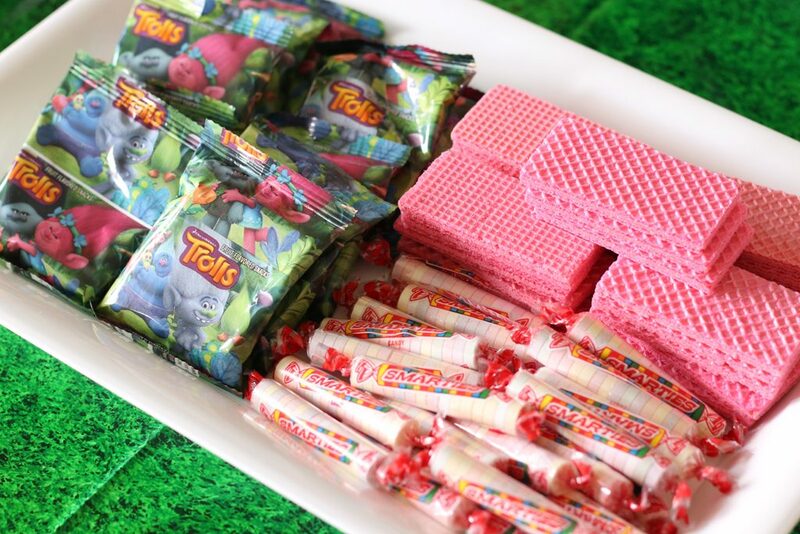 Shop the candy and snack aisles of your supermarket for foods items already branded with the Trolls design, like these fruit snacks! 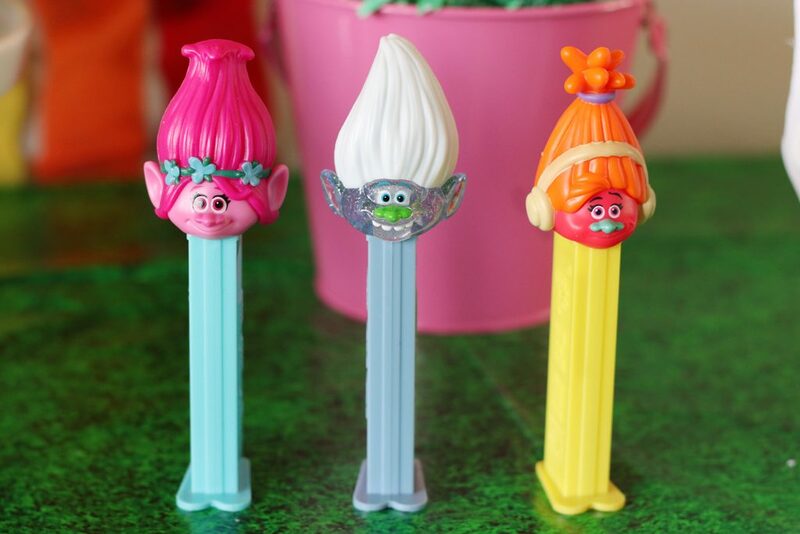 And when in doubt, grab some Pez dispensers featuring Guy Diamond, Branch, DJ Suki and Poppy herself! 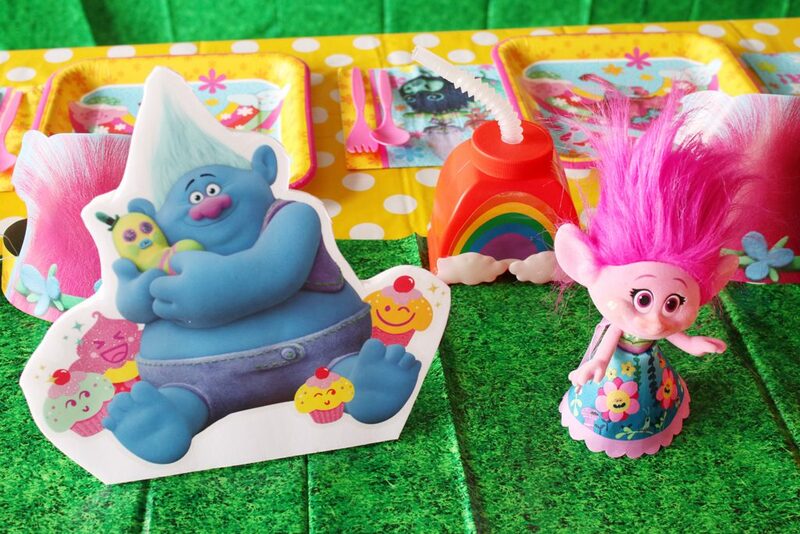 Keep everyone busy at your Trolls party with activity stations staged around your party space. Scrapbook station – Take everyone’s photo with an Instax camera and let them scrapbook it, just like Poppy documented all her adventures. Dance party – Turn on the Trolls party soundtrack and get ready to shake your hair to tunes from Justin Timberlake, Anna Kendrick and Ariana Grande! 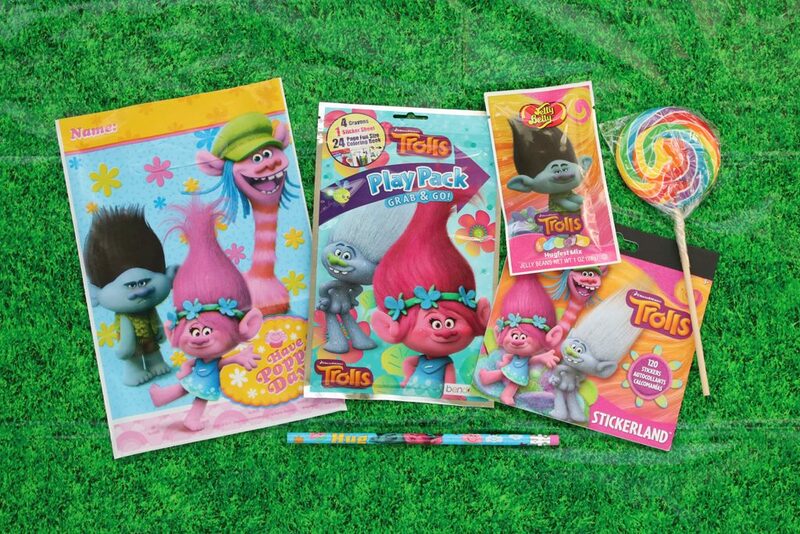 When it’s the end of the party and hug time is over, gift each of your besties a favor bag stuffed with Trolls themed goodies. 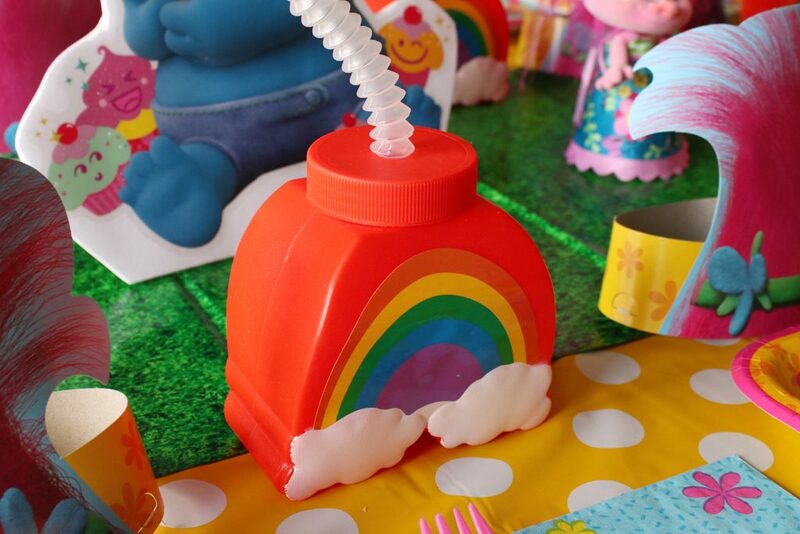 Shop for all of the Trolls party supplies you see here on Wholesalepartysupplies.com. 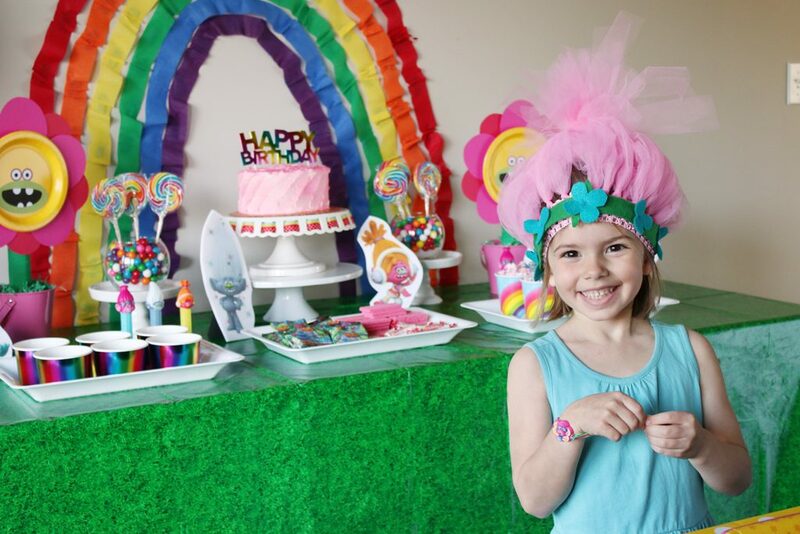 If you want to take this party to the next level, ask everyone to wear their favorite Troll Hair!